Christina, married with one child, lived in a small town in the Congo, near the city of Gorma. Her husband died, so she supported her son by cleaning offices in the airport. As the Congo deteriorated into a country with no peace, but constant fear, “with shooting, running all the time, just waiting to lose life,” she needed to leave to preserve their lives. Christina fled to Uganda, across the border from the Congo, to a refugee town where she supported herself and her son by washing clothes, cleaning houses and doing odd jobs (some refugees, who were able to support themselves did not have to live in the camps). However, she worried about her 2 brothers, who were missing after they fled. Two and a half years later, Christina met and married another man, had another child and then became pregnant again. 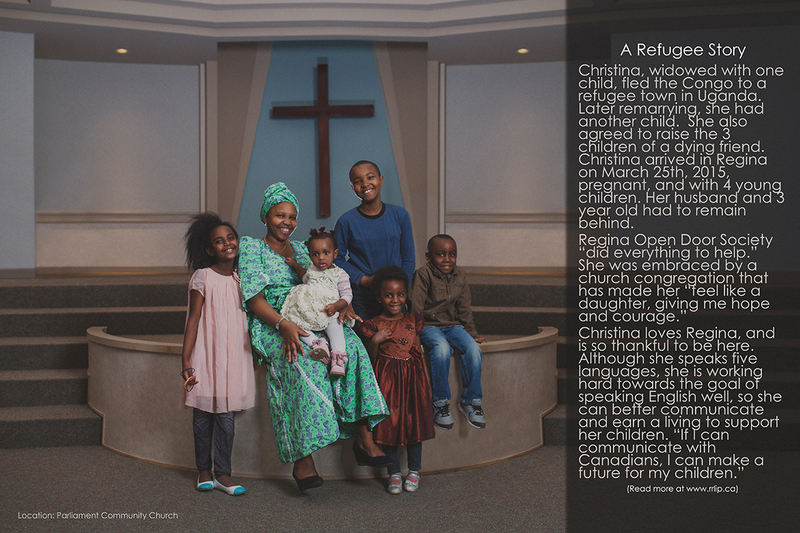 Christina had registered herself and her children with the Office of the Refugees in Uganda. She also registered her missing brothers, with the hope they would be found. Happily, one brother was discovered. After she married, however, her husband was not properly documented on the refugee application. When Christina left the refugee town, she was pregnant, and had with her two of her young children and three other orphans (a promise made to a friend dying of HIV—“please look after my children and give them a home, everyone else has died!”). Her husband and 3 yr. old child had to remain behind in Uganda. She arrived in Regina pregnant, with four young children and her brother on March 25th, 2015. According to Christina, Regina Open Door Society “did everything to help.” Assigned a Caseworker, Christina was introduced to all the essentials needed for her first months in her new home. In addition, she was embraced by a church congregation that has made her “feel like a daughter, giving me hope and courage.” Parliament Community Church members have gone out of their way to assist her and the children, helping her “like a parent with their child,” and providing the childcare needed for Christina to take the necessary English classes. Her “Angel Mom, Mama Vicki,” along with other congregation members, make her feel “so happy.” They are also assisting her in attempting to bring her son to Canada, accompanied by her second brother, who survived, and has been located. The lack of proper documentation is making it very difficult to bring her husband. Christina, veuve avec un enfant, a fui le Congo pour s’installer dans un village de réfugiés en Ouganda. Se remariant plus tard, elle a eu un autre enfant. Elle a aussi accepté d’élever les trois enfants d’une amie mourante. Christina est arrivée à Regina le 25 mars 2015, enceinte et accompagnée de quatre jeunes enfants. Son mari et son petit de trois ans ont dû rester derrière. La Regina Open Door Society « a tout fait pour nous aider ». Elle a été accueillie par une congrégation qui lui a fait sentir « comme une fille de la communauté, me donnant espoir et courage ». Christina adore Regina, et est très reconnaissante d’être ici. En plus des cinq langues qu’elle parle déjà, elle travaille fort pour bien parler l’anglais, afin de mieux communiquer et de gagner sa vie pour soutenir ses enfants. « Si je peux communiquer avec les Canadiens, je peux faire un avenir pour mes enfants ».